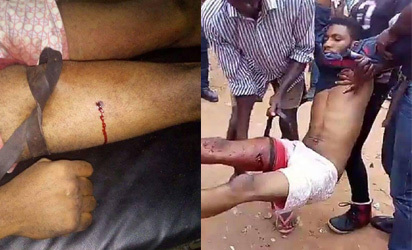 Scores of youths were allegedly injured, yesterday, as gunmen suspected to be soldiers, who came in Hilux Pick-up vans, allegedly attacked the Umuahia country home of leader of Indigenous People of Biafra, IPOB, Mazi Nnamdi Kanu. The IPOB claimed, last night, that five people were killed and about 30 others were injured in the attack. However, videos of the clash showing clubs and stone-wielding youths, who clashed with the troop, indicated that scores were injured. One of the youths, who was shot on his right thigh was seen battling for life as his colleagues administered first aid. IPOB Media and Publicity Secretary, Comrade Emma Powerful, told Vanguard that the attackers wore army and police uniforms and drove into the palace of the traditional ruler of Afaraukwu, who is the father of Nnamdi Kanu and started shooting people. “The attention of 14 Brigade Nigerian Army, has been drawn to fictitious news going round especially on the social media that troops have invaded the home of Nnamdi Kanu and killed three persons. “This is far from the truth. Rather, it was a group of suspected IPOB militants that blocked the road against troops of 145 Battalion while on show of force along FMC-World Bank Road in Umuahia town, Abia State at about 6.00-6.30pm, today (yesterday). “They insisted that the military vehicles would not pass and started pelting the soldiers with stones and broken bottles to the point of injuring an innocent female passerby and a soldier, Corporal Kolawole Mathew. “The troops fired warning shots in the air and the hoodlums dispersed. No life was lost.